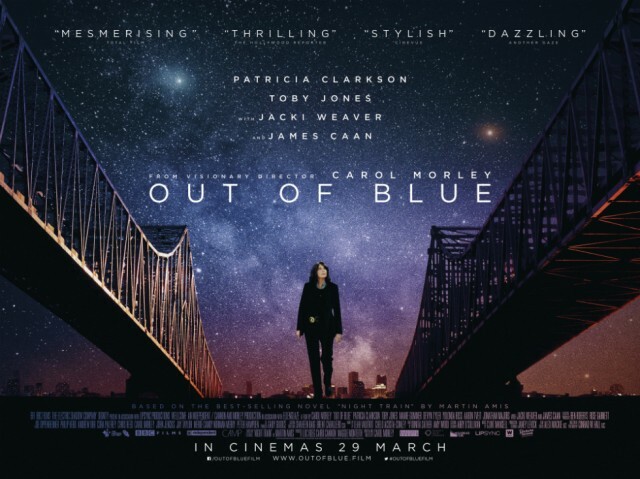 Subverting the conventions of film noir, Carol Morley’s latest Out of Blue opens in cinemas today. But, asks Mike Pinnington, does its heavily worn ambition result in a good story well told? 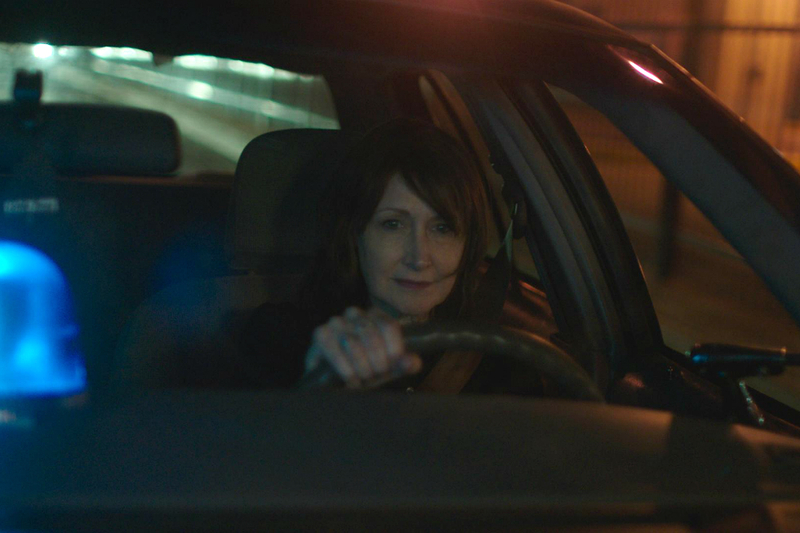 For her latest picture, Out of Blue, director Carol Morley continues to prod and explore where many other filmmakers would never dare to tread. In an era beset by franchises, including sequels and prequels, and of course a never-ending slew of remakes, Morley is a treasure, seemingly determined to remain unconventional. This is both unusual and heartening. She remains best known for her 2011 docudrama Dreams of a Life, where she pieced together fragmentary scraps of information to tell the story of 38-year-old Joyce Carol Vincent, whose body had remained undiscovered for three years. In 2014, Morley made The Falling. Starring Maxine Peake and Maisie Williams, the film chronicles a fainting epidemic sweeping an all girls’ school. Rarely has she made typical cinema, even when cloaked in genre film storytelling conventions. At a special preview event for Out of Blue (produced by Luc Roeg, son of Nic) at Liverpool’s FACT recently, Stockport-born Morley described how she had studied Fine Art Film at Central Saint Martins College of Art and Design, and how she didn’t really differentiate between long and short form, or genre, documentary or fiction. Perhaps this is at the root of the filmmaker’s atypical approach to selecting projects and bringing them to life. And so it is here, too, her latest an adaptation of Martin Amis’ Night Train, itself a comedic, less than straight take on American noir. Morley notes that, even for her, it might have seemed somewhat odd to bring a book of the notoriously misogynistic Amis, to the screen. Putting strangeness to one side (just for the time being), the plot deals with Patricia Clarkson’s recovering alcoholic homicide detective Mike Hoolihan. Along with her colleagues in the New Orleans Police Department, she is investigating the murder of leading astrophysicist and black hole expert Jennifer Rockwell, played sparingly, mostly in flashback with effective and affecting distance by Mamie Gummer. Beautiful, successful and respected in her field, Gummer’s Jennifer is found dead – shot in the face – in the university observatory. Suspects, it’s fair to say, aren’t exactly thin on the ground. Jennifer’s colleague Dr Ian Strammi (Toby Jones), for a while at least, seems nailed on for the murder. Then the finger of suspicion turns to her boyfriend, Jonathan Majors’ Duncan Reynolds, who was captured on CCTV, fleeing the scene late at night. There’s also talk of a return of the “.38 Calibre Killer”, a long-dormant serial killer from the 80s, with echoes of those cold-case killings found here. Hovering around suffocatingly, meanwhile, is the wealthy Rockwell family, especially dad Colonel Tom (James Caan), a decorated war hero and ex POW. The murder isn’t the only mystery faced by Hoolihan, however; Jennifer’s profession and the universe’s mysteries are always in close proximity, rubbing up against the usually steadfast veteran detective, making her queasily unsure of herself and her instincts. Clarkson’s character and wry performance are anchors for this film, which uses astrophysics, dark matter and black hole theories to pose questions about identity, parallel universes and our makeup. Here, arguably, the film’s problems start. Morley interrogates, sometimes in quite unsubtle ways – you can practically see the cogs moving – life’s big questions. Ironically, given that science is the basis from which these questions arise, it sometimes veers into mysticism territory. It’s a shame, because when these lines of enquiry are followed, punches satisfyingly land. “There are many ways to be a woman”, says Mike in an exchange with Jennifer’s mother Miriam (played with nervy intensity by Jacki Weaver). It’s pointedly delivered, is profound and true, and is effortlessly ambiguous, so that it operates on multiple levels. But, such resolutions are rarely reached, and the ambitious ideas and questions posed are left to hang in the air like dust motes, or the stardust that is referenced so regularly here that if becomes conspicuously throwaway. 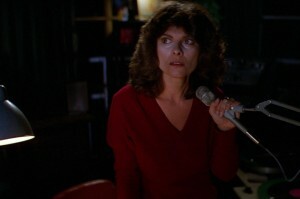 Out of Blue isn’t a bad film by any stretch. It is to be applauded for telling a more or less satisfying story while subverting noir and procedural conventions, and for telling that story through the eyes of an imperfect but resolutely independent lead – Clarkson’s Mike makes for a memorable presence. It is notable, then, for its ambition and breadth, but this breadth means that it sometimes feels loose, rather than the tautness that the greatest noir has in spades. Increasingly, you start to see the joins. And the end, when it comes, isn’t as satisfying or surprising as it might have been. It seems to artificially extend the third act, and is hampered somewhat by a kind of double-bluff (which I won’t reveal here). For all of this, however, Out of Blue remains an interesting film worth supporting and – like its director’s earlier output – has stayed with me.